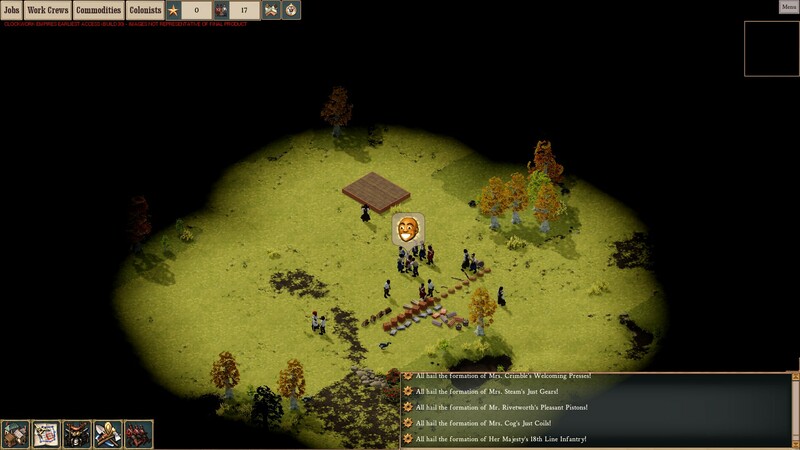 This article contains coverage of a preview build of Clockwork Empires. The opinions expressed below pertain to a piece of software in early access state (Version 31), and may deal with features which are in an incomplete or prototype form. The coverage below is intended to provide a general impression of the game in its present state and may or may not apply to the finished game. 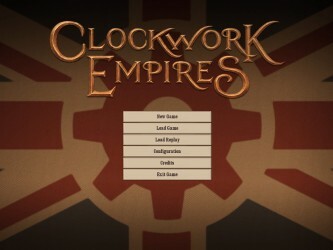 It is remarkable how frequently I’ll look at a game and say, “I can’t imagine how I’ll end up getting into this game,” then three hours later I’m saying, “My God this game is addictive.” Such was the case with Clockwork Empires. 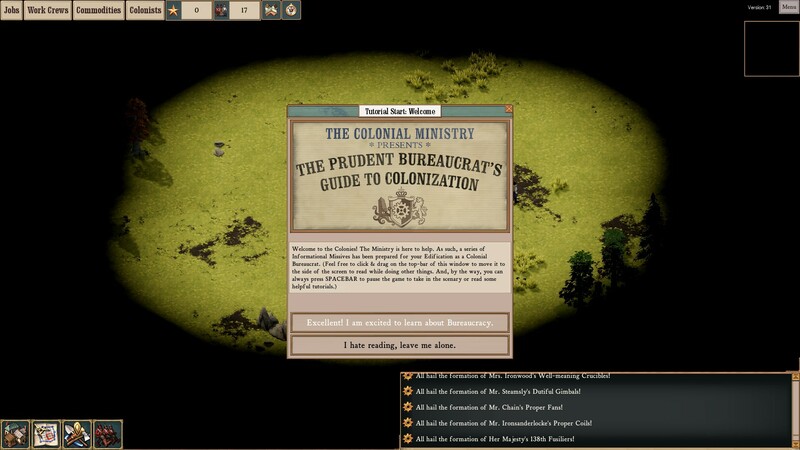 It is the latest in a line of games that I tend to call “Management Simulators.” Think of The Sims with bigger goals, or Gnomoria with a more colonial feel. Or Evil Genius with 90% less evil and 40% less genius. You know what? Maybe forget what I said about 40% less genius. 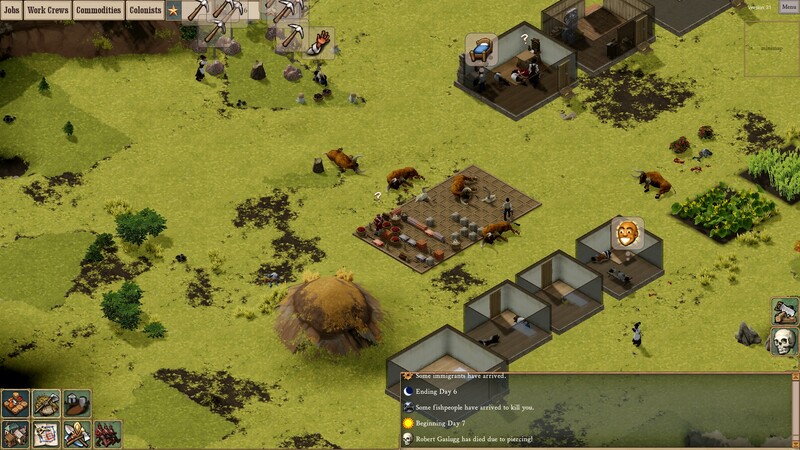 Clockwork Empires is a game of colony building. You begin by selecting a piece of land to start your colony. There are three points on the map at the time of this writing, and each one provides you with a bit of information about the area, including the biomes present and the potential threat of fish people. Once you select one, you’re plopped down with a small military force, some overseers, and some workers, as well as enough materials to get started. From that point, you are on your own. 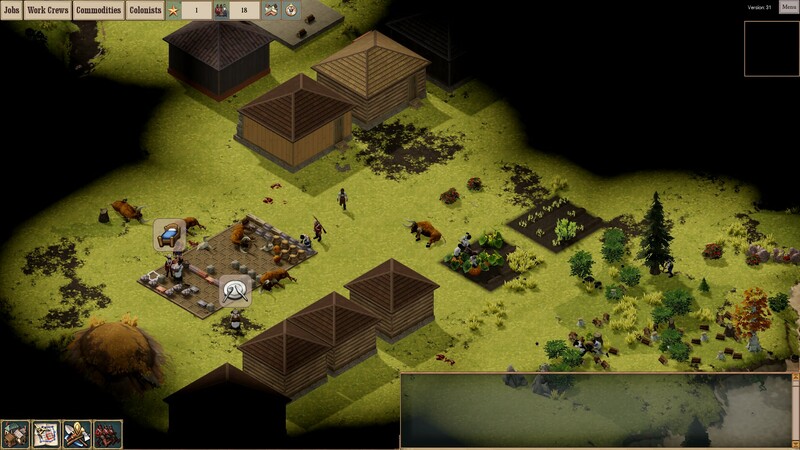 You’ll need to either find or craft everything you need to survive, from food to shelter to ammunition. Initially the game offered no guidance whatsoever, but an update added in a much needed set of tutorial windows. Like the other games I discussed, one of the interesting aspects of Clockwork Empires is the fact that you don’t issue any direct orders. The best you can do is create tasks and assemble specialized teams. Once a task exists and a team that can perform the task becomes idle, they’ll (hopefully) claim it. This has plusses and minuses. On the plus side, it prevents you from micromanaging, because you can’t micromanage. That’s what your overseers are for (the colonists who head up work groups). It also means that if you don’t have a large population, you need to keep your queue of tasks manageable or time critical stuff might not float to the top in time. Farming, for example, needs fairly frequent tending. Failure to do so can lead to crop spoilage. Not being able to assign things directly doesn’t mean you can’t take intelligent control over things. Every workgroup (which can be customized to have the best suited workers) has a list of tasks they should and should not perform. In the instance of the farming for instance, if you have a large work group which can only do tasks associated with farming, then it doesn’t matter how deep the foraging, hauling, or crafting queue gets, farming is what they will do. It’s fall, so naturally I’m growing pumpkins. Pumpkins are excellent and anyone who tells you otherwise is mistaken. Clockwork Empires is very much a trial and error game, particularly at the beginning. Some workshops require the materials they create, so you need to use your starting equipment to craft them or you are almost screwed right out of the gate. To the developer’s credit, you are only almost screwed. There are random events and chance finds which can bail you out. A wrecked boat, for example, could provide you with salvaged bricks to make your ceramics furnace. Or maybe you can ask for a supply shipment, which becomes possible from time to time. In addition to keeping you colonists sheltered, fed, and productive, you must also keep them protected. My colony had a bit of a fish people problem. Periodically the moist menace would attack and I’d be left with no choice but to form a militia or rally my brave soldiers. When I wasn’t quite on the ball, and my dedicated soldiers were all sleeping in freshly built cots, I ended up losing two colonists and having to create a graveyard. This guy is having a conversation about a smiling bald man. Captivating. The big claim to fame that sets this game apart from similar ones in the genre is the depth of detail individual colonists have. Each one, aside from specialties, social classes, and skills, has memories. These could have come over with them on the voyage to the colony (such as the memory of an unhappy voyage) or they could be produced by pleasant or traumatic events during gameplay. These memories affect the future behavior of your colonists. Those who had encounters with fish people tended to be far more likely to run for the hills when a new wave of them attacked. It’s a cool layer of detail, though if you play from a high enough level (figuratively speaking) you might not even notice it. Beyond the gameplay, even at this early state the game has an undeniable style and charm. Everything from the auto-generated workgroup names to the abundant flavor text has a “Pip pip cheerio, stiff upper lip, for queen and country and all that rot” feel to it. It fits the steampunky visual aesthetic fairly well, and I found myself looking forward to the menu options and tutorial text just to see what sort of fun phrasing they would throw at me next. The music, which seldom grabs me in game such as this, is decent. Audio cues let you know when there are dangers lurking about, and other times just make the game feel light and industrious. This is an early access title, so it isn’t without its rough edges. Early on I encountered a fair amount of placeholder text, and even after the most recent update (Sept. 16th) I found myself running into the occasion crash. This was particularly irritating, because load times and save times are currently VERY long, a minute or more on my PC, so the tendency to forego the long downtime required for a save will bite you every time you crash. My people also had a tendency to ignore certain tasks. Two people nearly starved to death because the colony seemed to collectively forget how to butcher cattle. Come on, guys! Beef! It’s what’s for dinner! Overall I am really enjoying Clockwork Empires, and I eagerly await its final iteration. I even MORE eagerly await the inevitable Wiki that will make it just a bit easier to craft your early game experience.